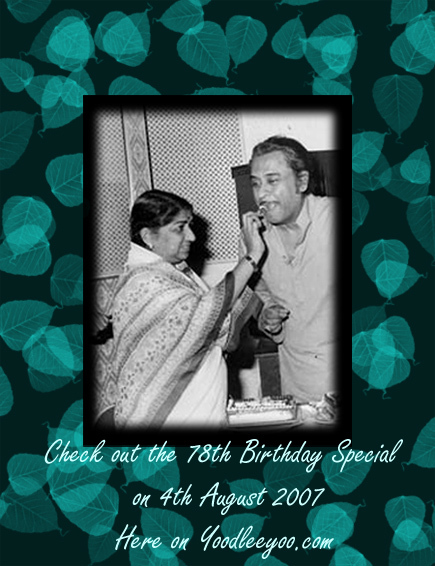 Kishore Kumar » Blog Archive » Tomorrow’s Special!!! Home » Specials » Tomorrow's Special!!! All day through celebrations on Yoodleeyoo.com starting from 9:00 hours IST. This entry was posted on Friday, August 3rd, 2007 at 12:21 pm	and is filed under Specials. You can follow any responses to this entry through the RSS 2.0 feed. You can skip to the end and leave a response. Pinging is currently not allowed. A versatile genious with eccentric mood. The one and only one Kishore Kumar. I pay my tribute to him for his great contribution to Indian Cinema.